A few weeks ago, my family and I visited Legoland in California for the first time and we had a blast. I put together a list of some of our favorite treats in the park. Before we left, I tried to research where and what to eat in the park and couldn’t find any good information, so I decided to make my own list so that you can get excited about some of the yummy treats at Legoland! 1. 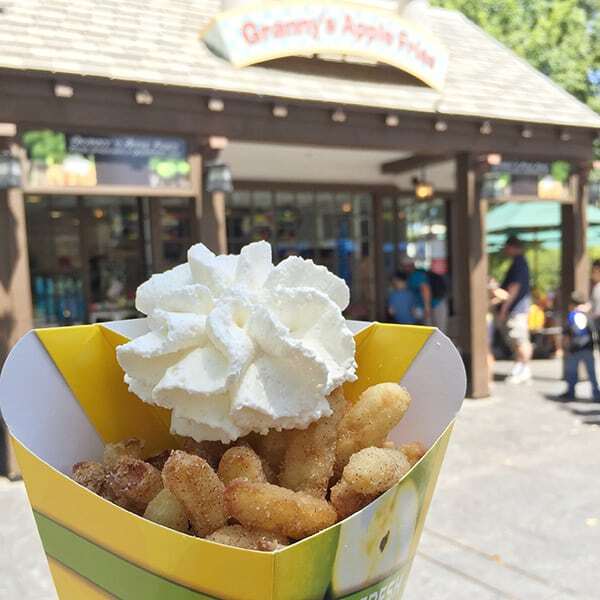 Granny’s Apple Fries – This is the only must-try I could find mentioned anywhere before we headed to the park. These are Legoland’s signature snack, served at a stand toward the very back of the park. We loved the little fried pieces of apple heaven, and they serve them with a dollop of whipped cream for dipping. One box, about the size of a large order of french fries, was enough for the whole family to share. 2. 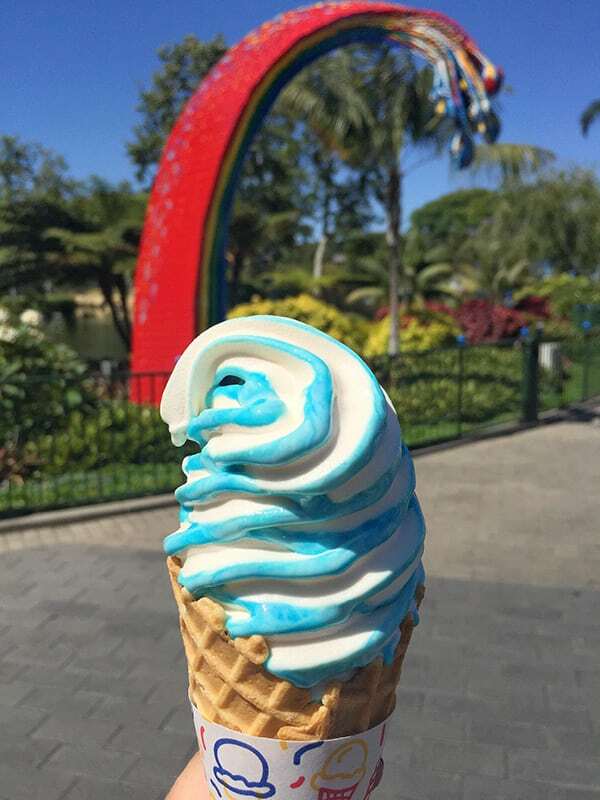 Magic Swirl Ice Cream Cone – These were our favorite! Not only are they fun and colorful, they are delicious. We found these served at two places in the park. One to the left as you enter, and one at the very back of the park to the left of the waterpark entrance. It is a snack counter next to the exit for the Lego Factory Tour. Both locations carried different flavors. We sampled all different flavors and went back the next day for another. Cotton Candy (pictured above in blue) and raspberry (not as pretty but wonderful) were my favorites. 3. 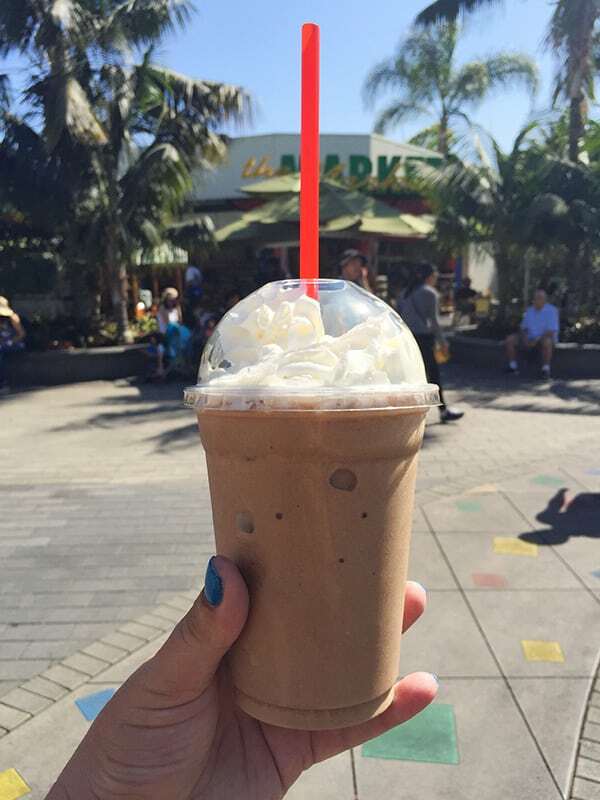 Cafe Mocha Freeze – I found this absolutely delicious coffee drink in The Market which is off to the left when you enter the park. It was rich and chocolatey, and a perfect caffeine boost in the afternoon. 4. 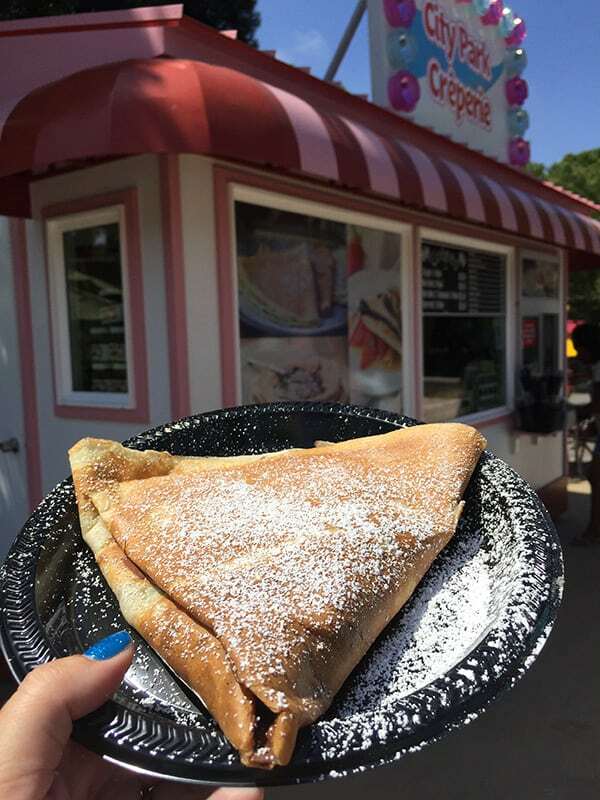 Nutella Crepe – Inside of the brand new Heartlake City area of Legoland you will find the City Park Creperie. I had them add strawberries to our Nutella crepe and we were in heaven! 5. Coca-Cola Freestyle Machine – I’m kicking myself for not taking a picture of this fab machine! In several places throughout the park, the one we visited was at the food counter near the exit of the Lego Factory Tour, there are Freestyle machines that allow you to create your own combination of flavors with Coke products. If you like a little vanilla in your Coke, or lime in your Diet Coke, this is the machine for you! If you are planning a trip to Legoland, I’ll be sharing more tips soon! We had a really great time! We found the best deal through Get Away Today, and I highly recommend booking your trip with them. They even have a layaway option if you want to make payments! If you use the promo code Pencil you can save $10 off a Southern California package when you book with Get Away Today. If you are a fan of Harry Potter, check out my tips for visiting The Wizarding World of Harry Potter. Thanks for Lego. Land.we just found out the are building one here in New York .cant wait. I didn’t know that! How exciting! Thanks! We’re here right now & I’m definitely having the kids try the magic swirls before we head out. The best Legoland deal we found besides their 5 day deal was for 3 days for all 3 spots from Costco. We got it online . You have 30 days to use the 2nd & 3rd days. If you have extra time in San Diego, buy the Belmont Park deal as well. Plenty of fun, especially for the older kids.